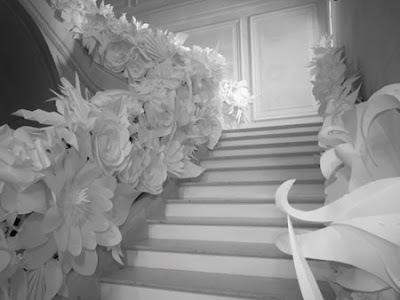 Because I posted about Chanel Haute Couture 2009 I thought it would be nice to give some credit to the decor that was used, too. Quite some work was put into the paper tiaras, but clearly no effort was too big to make lawish monochromatic arrangements, too. 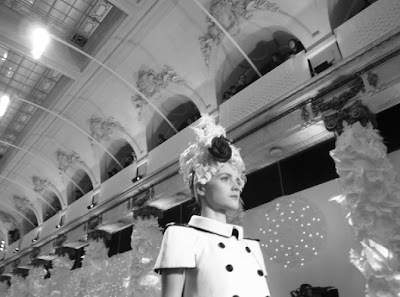 I have to say that beyond the use of B&W only, the collection was anything but minimalistic. 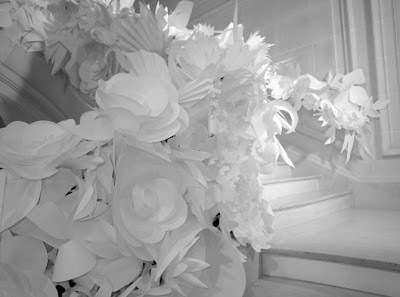 Some numbers: the paper roses, daises and leaves were wrapped around the 32 columns of the Cambon-Capucines pavilion. All in all, around 7000 (!) handmade paper flowers. 4000 sqm of paper were used to put up these beauties. 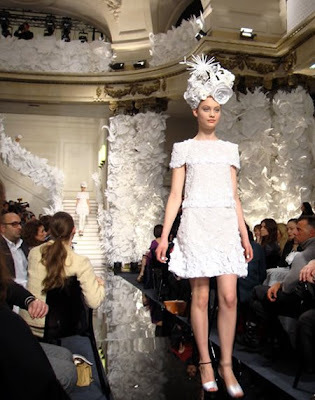 So, if you know me, I'm sure you know I have a big soft spot for DIY activities, but something like this, for a couture show is beyond anything I could have ever imagined. Also, should I tell you I keep some shoe boxes full of paper foldings done at an origami class some years back? I would feel sorry if I would decide to throw them away. 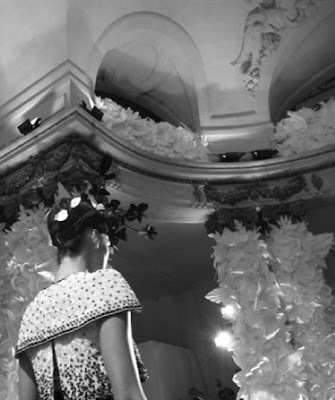 I wonder, what on earth happened with those Chanel paper roses after the show? It would have been nice if they would given them to kids in the streets to play with them. Other than that, what I appreciate more than the sole fact of so many handmade items, is that the entire show kept on a decent budget. Well, it depends on the type of paper that was used, but...? For a couture show, anyway.